If you’re a cat owner, it’s possible to teach your cat or kitten to use a crate. The training methods for teaching pets to use a crate are slightly different, and it may take your cat a bit more time to get used it. But, once you’re able to get them to use their crate regularly, it’ll be easy. Being able to train your cat can serve many purposes. It can be used to help your cat learn how to use a litter box. It can also keep them safe while you’re traveling. Or, you can leave them in their crate during the day or night to protect your furniture while you’re at work or sleeping. The idea is to make it a special place for them. It should feel more like a comfortable home, and not like a prison. If your cat has a fear of their crate, getting them into it can be nearly impossible and can even be dangerous for both of you. It’s easiest to crate train your cat when they’re young. Training a kitten to be comfortable in a cage from the start can develop good habits about using it and not being frightened. But, that doesn’t mean you can’t crate train an older cat. 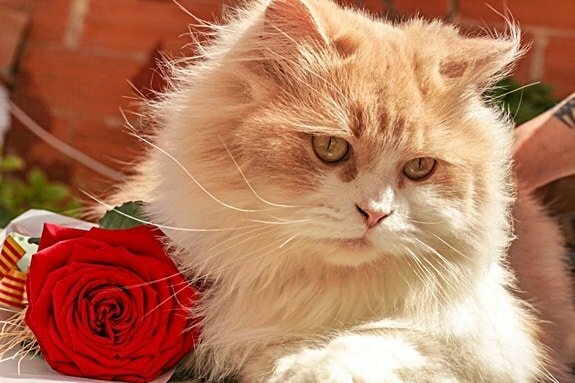 Even cats who currently don’t like them can change with the right training tips. So, let take a closer look at what you can do to make life easier. 1 What is the Best Way to Crate Train a Cat? 1.2 Can You Crate Train a Cat During the Day? 1.3 How Long Can a Cat Stay in a Crate? 1.4 Can You Crate Train a Kitten? 1.6.1 Which Cat Crate is Right for Me? What is the Best Way to Crate Train a Cat? This guide will provide tips you can use to make crate training a better experience. To do this, you need to make sure you’re using the right kind of crate. We’ll cover some of the best options to keep your cat safe. Once you have the right one, specific training methods and exercises can make it easier for your cat to get used to the experience. If you’re able to be patient and consistent, you can make sure your cat’s crate is their own personal getaway, rather than something scary for them. There are many different reasons you might want to crate train your cat. It’s not just for your convenience. As you can see, there are many benefits. But, you can’t just expect your cat to climb into a crate or carrier without some training, first. If you try to force them to do so, you could be creating a negative experience for them. That will make crating them in the future much harder. Taking the time to train them properly is essential when it comes to getting them in and out of a crate. Can You Crate Train a Cat During the Day? Crating your cat during the day can serve a few purposes. First, it can keep your cat safe. It will also keep your furniture and belongings safe from scratching if you’re away at work. Many pet owners crate train a cat to use a litter box, too. It’s easy to feel like you’re being cruel by keeping your cat in a cage all day. Is it bad to keep a cat in a cage? No, but it is essential to use the right kind of cage and methods for them to use it. If you plan to leave your cat in a cage all day, it needs to be reasonably large. You may want to look at inexpensive dog crates as an option. They’ll usually be bigger and sturdy enough to keep your cat safe all day. 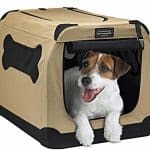 One of the best for housing your cat is the Petmate Vari-Kennel Plastic Dog Crate. This will be big enough to make your cat comfortable, but it can also serve a dual purpose. Crate training a cat to use a litter box is easier with a crate like the Petmate variety. Introduce the crate to your cat by putting her favorite meal just inside of it. You want to make sure she knows it’s her home, and it’s a happy place. If you’re training her to use the litter box, you should cover the entire bottom of the crate with litter. Once your cat goes in on her own, keep it closed. You can take her out to clean the crate and feed her, but make sure she’s inside the rest of the time. Keeping the crate clean is extremely important! Once your cat has gotten used to going to the bathroom with the litter in the crate, you should clean it out thoroughly. Then, place a litter box in one corner of the crate. She’ll associate the litter with being able to go to the bathroom and will start to use it. Keep a few of your cat’s favorite toys in the clean crate, so she doesn’t get bored during the day. A small water bowl is also a good idea. Once your cat has been litter trained in the crate, you can choose to keep the litter box in there or put it somewhere else. You’ve created an environment for your cat that they are comfortable using. If they know good things are associated with their crate, they shouldn’t have a problem going in there for the day. Keep in mind that the above process can take weeks, and you should never rush or force your cat into their cage. How Long Can a Cat Stay in a Crate? How long a cat can stay in a crate depends on your cat’s personality and the type of crate you’re using. Cats shouldn’t live in a cage permanently. But, if you’re training them, they can remain in it for quite a while with no adverse effects. This is especially true if you’re training them to use a litter box using the crate method. There is a misconception that crating is cruel. Depending on your cat’s personality they can end up loving it. If you make it cozy and comfortable for them, it can help them to feel safe and secure. Many owners use crates for senior cats who might be scared in open spaces. So, while your cat shouldn’t spend days on end inside their crate, don’t feel bad about allowing them to be in there for hours at a time. If they learn to like it, they’ll start walking in on their own and spending time there without you having to coax them in. Can You Crate Train a Kitten? 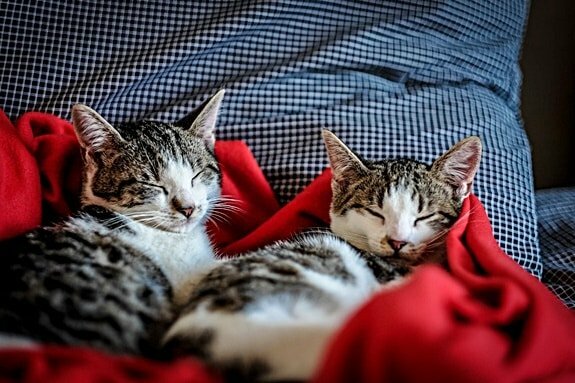 You can crate train a kitten, and it can be beneficial for you both. In fact, some cat rescue programs crate train feral kittens to socialize them and make them calmer. If you wonder if you can put a kitten in a cage at night, it’s a great way to protect your belongings and train a new kitty. Like the litter training method above, leaving your new kitten in a crate overnight can give them their own comfortable space and teach them to use a litter box. If your kitten is fearful, you can even crate train them with the door to the crate open. This will let them know that the crate is still their safe space, but they have the freedom to wander around the home. If they get scared, they can quickly run back to the crate. Keep in mind that there is a difference between a carrier and a crate. A crate is more often used in the home. It can be viewed as a semi-permanent space for your cat, like their own private retreat. 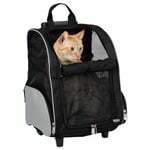 A carrier can be used for travel or to transport your cat if you need to take them somewhere. A cat carrier should have similar characteristics to what a small dog carrier might have. The most important thing is keeping your pet safe and comfortable. But, it should also be a carrier that’s easy for you to use. The better it is for both you and your cat, the more often you’ll use it. You might think that you can get away with the smallest carrier on the market since cats are usually a lot smaller than dogs. But, smaller isn’t always the best option. You should take your cat’s measurements before buying the perfect carrier for them. Most carriers will suggest they can hold up to a certain weight. It’s more important that your cat has enough room to stand up and turn around. Measuring your cat’s height and their length will be more accurate than knowing their weight. Two other extra features to consider are a collapsible crate or one with more than one entry door. A collapsible carrier can make it easy to store away when you don’t need it. This is great if you travel a lot and don’t have a lot of extra space. Many soft-sided pet carriers are collapsible and have most of the above features. A carrier with more than one entry point is also essential for cats. 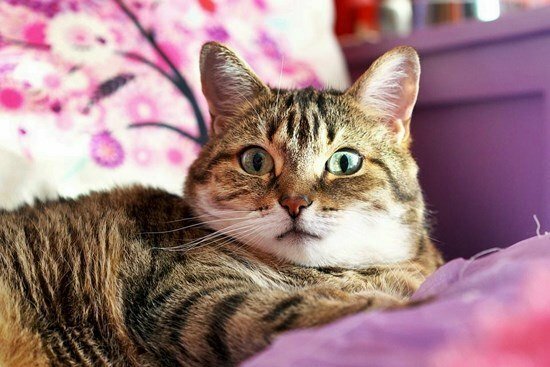 If your cat is nervous or scared, it may not be easy to coax them into the carrier. In these cases, a top-loading carrier can be helpful. It can sometimes be harder to get a cat used to a carrier than a dog. Being able to load them down into a carrier rather than having them go in the front can be easier for you. It also helps the cat to remain calmer. If you want to train your cat to go into a crate to stay during the day, the method can be different than litter training. Keep in mind that it will still take time and can even take weeks of consistent practice. The method starts the same as litter training, but you don’t need to line the crate with litter. Instead, just put their litter box in one corner. Then, work on making it a happy place for your cat. This can include a bed and some of their favorite toys. Use the treat method. If your cat is food-motivated, this can work well and can help them associate the crate with something they love. Start by calling their name and placing a treat next to them. Once you have their attention, place a treat a few feet in front of them, then a few more. When you get to the crate, place a treat just inside and step away. Your cat may go inside, eat the treat, and run back out. This is still progress! Next time, try putting one or two treats further into the crate. Use your cat’s favorite food to lure them or switch out the treats you’re using if the above tip doesn’t work well. If the treat or food doesn’t lure your cat into the crate, try using pheromones. You can buy these at almost any pet store. A gentle spray on their bed in the crate can attract them to it. Get your cat used to going in and out several times a day. Let them come and go as they please in and out of the crate if they seem anxious about it at first. Then, when you need it to be closed, they are less likely to be nervous. Which Cat Crate is Right for Me? The right cat crate or carrier greatly depends on what you’ll be using it for the most. If it’s strictly for home use, a large crate is probably your best option. If you want a carrier for taking your cat on trips to the vet or on other short trips, a soft-sided carrier is a good choice. If you want your cat to travel with you wherever you go, make sure you find an airline approved pet carrier. As long as the carrier you choose is safe and comfortable for your cat and practical for you, it’s hard to go wrong. If you do want to travel with your cat, choosing the right carrier is only half the battle. 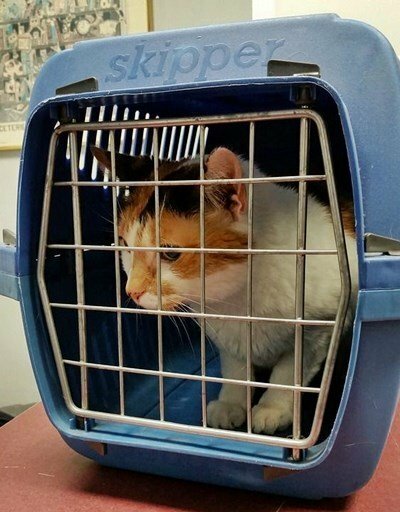 Even if your cat is used to being in a crate at home, you can’t always expect them to be comfortable traveling in a carrier right away. The best way to get them used to travel is first to get them used to the carrier at home. Letting them get comfortable with it in a familiar space is a great start. Then, go on short trips in the car, and make the trips a bit longer over time. It’s also essential that your cat doesn’t associate travel with something negative. So, don’t only put them in a carrier to go to the vet or somewhere they don’t enjoy. It’s easy for some people to brush off the idea of crate training a cat. Most of the time, we think crate training only works for dogs. But, as you can see, there are not only many reasons to crate train a cat, but different strategies on how to do it! Remember, it’s not cruel to cage a cat when you’re doing it for the right reasons. And, of course, if you’re not forcing the cat into the crate for any reason. It doesn’t matter if you have an older cat or a kitten. If you need to put them in a crate for some reason, it’s never too early or too late to train them. The most important thing to keep in mind is that you want to create a space they enjoy. Training them to love their crate or carrier will make life much easier for you and will put less stress on your cat. What's the Best Cat Carrier Backpack for Hiking and Walking?